GENEVA, Jun 22 2018 - IOM, the UN Migration Agency, reports that 40,944 migrants and refugees entered Europe by sea through the first 171 days of 2018. That total compares to 84,675 at this time last year, and over 215,997 at this time in 2016. In other words: Mediterranean arrivals at this point in 2018 are running at significantly below half of last year’s total to date, and some 19 per cent of 2016’s volume at this same point during that year. Deaths, too, are much lower than at comparable periods of the past two years. In 2017 IOM’s Missing Migrants Project reported 2,133 deaths through 21 June; at this point in 2016 the figure was 2,911 – or over three times 2018’s estimated total of 960. The largest shortfall since last year has been on transit via the so-called Central Mediterranean route linking North Africa to Italy. 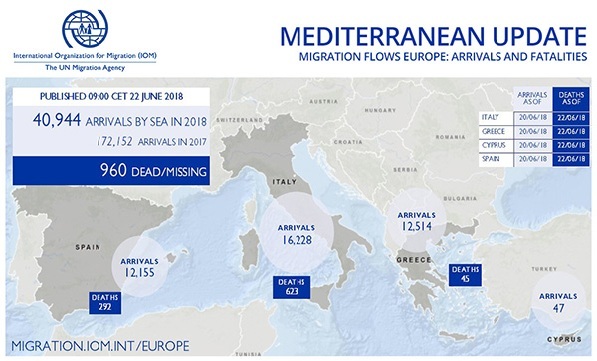 IOM Rome’s Flavio Di Giacomo notes that this year’s traffic towards Italian ports – 16,228 men, women and children through 20 June – is at a level nearly 78 per cent below that recorded through 20 June last year. With the year swiftly approaching its mid-point, IOM notes that in none of the past four years have irregular migrant sea arrivals fallen short of 119,000 – last year’s total. This year migrant arrivals to Italy by sea are below 17,000 – a remarkable turnaround for a country that has witnessed an annual average arrival rate of 156,000 migrants per year over the last four years (see chart below). June arrivals to Italy, Di Giacomo recorded, are running now at less than 25 per cent of their 2017 rate, and less than 33 per cent of 2016’s volume (see chart below). Nonetheless, the perils faced by migrants remain daunting. IOM Rome’s Flavio Di Giacomo notes that Italy’s most recent landing was recorded on 19 June in Pozzallo, where the ship of the Italian Coast Guard “Diciotti” brought a total of 523 migrants saved during the previous days in the Mediterranean. Among them were survivors of a shipwreck that occurred on 12th June, migrants who had been rescued by the US Navy ship USS Trenton. Those, mostly sub-Saharan Africans, said they had left Zuwara, in Libya, during the night of 11 June, sailing on a dinghy carrying 117 people, including 20 women and a one-year-old child. After seven hours of navigation, the boat began to deflate and many migrants fell into the water. The US Trenton, patrolling nearby, intervened and managed to bring 41 people to safety. Overall, 76 migrants lost their lives, survivors said, including 15 of the 20 women and the one-year-old child. Upon arrival in Italy, these migrants were exhausted by the stress and the trauma they experienced; many also reported being victims of terrible violence perpetrated by their smugglers: kept locked for months in a house near the sea, where men reportedly were beaten and women were raped. Early Thursday (21 June) IOM Libya’s Christine Petré reported on several ongoing search and rescue operations unfolding along Libya’s coastline. The Libyan Coast Guard, she said, returned 301 migrants (252 men, three women and 46 children – all boys); the majority from Guinea, Cameroon, Senegal and Côte d’Ivoire were transferred to Trig al Seka detention centre. IOM offered emergency assistance. The migrants said they started their journey in Garaboli, leaving on two rubber dinghies. The migrants received emergency primary health assistance, and protection screenings were provided at the disembarkation point. Petré added that on Wednesday (20 June), the Libyan Coast Guard returned 42 migrants (36 men, four women and two children) who also received IOM emergency assistance. The migrants started their journey in Garaboli on one rubber dinghy. All migrants were registered by the Libyan Coast Guard. The migrants, the majority from Guinea, Mali, Côte d’Ivoire and Nigeria, were then transferred to Ain Zara detention centre. Tragically, the body of a Guinean national was retrieved during the operation. Later that day, 20 migrants (19 from Mali and one from Guinea) were returned to Basis disembarkation point by the Libyan Coast Guard and transferred to Tajoura detention centre. For the week, IOM Libya is reporting 936 migrants returned to shore by authorities. The latest incident occurred Friday morning when 85 migrants were returned near Tripoli. Most were from Pakistan and Algeria. So far this year, 8,310 migrants have been returned to the Libyan shore by the Libyan Coast Guard, Petré reported. A total of 37 corpses were retrieved on Libyan soil this week after washing ashore. Additionally, there are reports of a capsized dinghy on Tuesday (19 June) north of Almaya. Survivors reported most passengers were from Sudan. 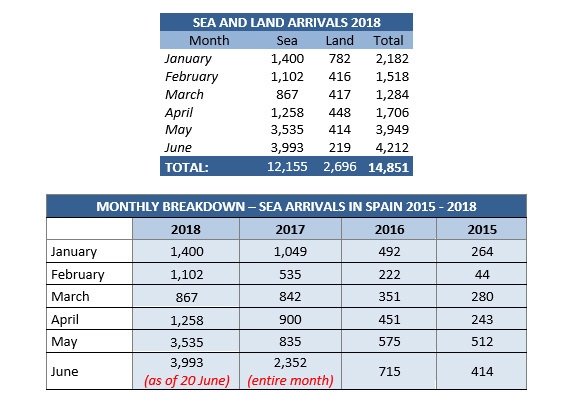 IOM Madrid’s Ana Dodevska reported Thursday Spanish arrivals in June through the 20th of the month are 3,993, by far the heaviest volume for any month this year so far, and on track to be the busiest month off Spain in over four years of the current Mediterranean emergency (see charts below). IOM’s team in the Balkans reported this week that during the first two weeks of June, authorities in Bosnia and Herzegovina registered 1,076 new migrants and asylum seekers which totals to more than 6,600 arrivals since the beginning of 2018 (almost six times the 1,119 reported for all of 2017). Pakistan is the most commonly reported origin country by irregular migrants and asylum seekers registered this year in Bosnia and Herzegovina (27% of all cases), followed by Syrian Arab Republic (18%), Afghanistan (13%) Iran (11%) and Iraq (8%). Authorities in Montenegro reported 285 irregular apprehensions in the first two weeks of June, adding up to a total of 1,733 migrants and asylum seekers intercepted by the authorities in Montenegro since the starts of this year. This shows nine times increase in arrivals to Montenegro when compared to 187 registered in the same period in 2017 and increase of more than double when compared to the 807 registered arrivals in the whole of 2017. Migrants and asylum seekers registered in Montenegro are mostly of Syrian origin (45%), followed by those declaring Pakistani (16%), Algerian (11%) and Iraqi (8%) origin. In Albania, another 46 irregular apprehensions on entry were reported in the first two weeks of June 2018 giving a total of 1,733 since the beginning of the year. Further on, another 421 migrants and asylum seekers were registered on exit from the country on the border with Montenegro between April and June. More than a third of the overall registered population were of Syrian origin and another 28% reported Algerian origin and 13% Libyan. According to available data, intensified movements have been observed also in Slovenia where in May only, authorities apprehended 1,158 irregular migrants, almost double than the 573 reported in April 2018. Between January and May authorities registered a total of 2,383 migrants and refugees, four times increase compared to the 567 registered in the same period 2017. One quarter of individuals declared themselves as nationals of Pakistan (27%), followed by Algeria (19%), Syrian Arab Republic (9%), Afghanistan (7%) and Morocco (7%). IOM Greece’s Christine Nikolaidou reported Thursday that over three days (18-20 June) the Hellenic Coast Guard reported at least three incidents requiring search and rescue operations off the islands of Samos and Lesvos. The Hellenic Coast Guard rescued 48 migrants off the island of Samos and 38 migrants off the island of Lesvos – a total of 86 migrants – and transferred them to the two islands. 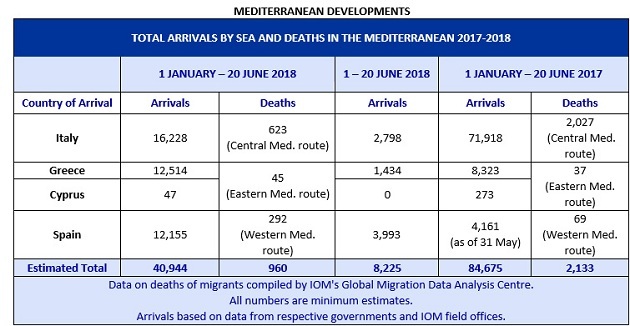 IOM Greece further reported that besides those 86, another 75 irregular migrants arrived during the three days, landing in Oinouses and Kos, and bringing to 12,514 the total number of irregular migrants entering Greece via sea since January 1 – an average of around 73 persons per day (see charts below). IOM Greece also reports that “Omed,” a three-year-old boy, lost his life in the open accommodation site located at Thiva, Greece. The boy, who was found dead in the sewage tank, was from Iraq. The incident took place Monday evening (18 June), just hours after his family reported his disappearance. Greek authorities have started an investigation; IOM has no update regarding autopsy results or the investigation. 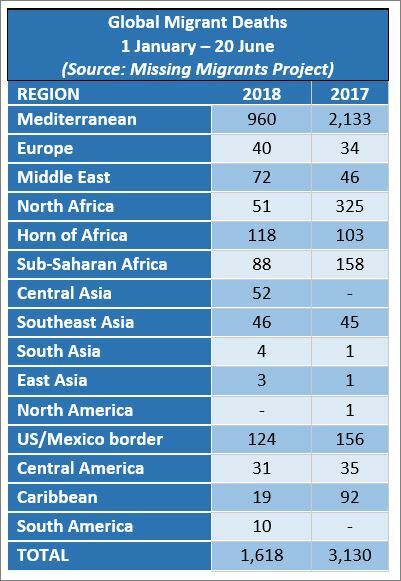 Worldwide, IOM’s Missing Migrants Project has recorded 1,592 people who died or went missing while migrating in 2018 (see chart below). In the Mediterranean alone, 960 people have lost their lives at sea since the beginning of the year. In the Central Mediterranean, at least 12 people have died in the past four days off the coast of Libya. On 18 June, the remains of five people, including two women, were recovered from a sinking boat 8 miles of Melittah area in Tripoli, Libya. The day after, a boat capsized north of Al Maya. Five survivors were rescued and transferred to the Janzour Hospital, while the remains of six people, including two children, were retrieved on the shore. On 20 June, the Libyan Coast Guard intercepted 82 migrants and recovered one body from a boat north of Tajura, Libya. There were several other additions to the Missing Migrants Project database since Tuesday’s update. On the US/Mexico border, the remains of a young man who died from dehydration were recovered on 18 June on the side of highway 131 between Eagle Pass and Brackettville. Previously, on 10 June, the remains of one migrant were found in a ranch near Falfurrias in Brooks County, Texas. The same day, a man drowned in the Río Bravo – his body was recovered in McAllen, Hidalgo County. In Europe, a 20-year-old Guinean man was crushed by a bus near Brussels, Belgium. The young migrant was clinging to the axle underneath the bus, which was bound for the UK, when he was tragically killed as the vehicle stopped.